from around the world. A true Marine Treasure. Age Defying Pearl Powder™ is 4000 mesh for Perfect absorbability and efficacy. We aced the tests by WHO GMP for product control, integrity, purity and safety. They guarantee that our product is of Most astounding quality. The ocean contains an array of bio-active molecules that have been researched for their health and beauty benefits, one such aquatic material is a pearl. Pearl and its grounded pure pearl powder are commonly used in traditional Chinese medicine for beauty treatments and various ailments. It has been used for over 3000 years for lustrous, beautiful skin...a treasure has been used to promote good health and vitality, as well as beautifying the skin. It is renown for fighting signs of aging and disease. 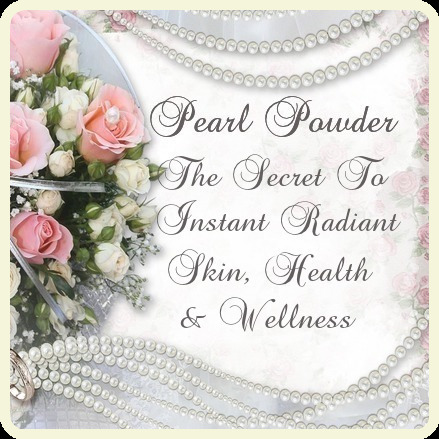 Age Defying Pearl Powder™ comes from Genuine, 100% Pure, Pearls renown for their healing and beautifying properties. They are disinfected to enhance their purity. Pearl Powder contains over 90 vital minerals essential to your well-being, along with proteins and peptides which contribute to the body's antioxidant defense system, and other trace elements; non-protein acid - taurine, which aids in inflammation and relieves vision and skin fatigue. It also contains vitamins A, the entire vitamin B group, C, D E, H and K, amino acids and antibacterial substances. In fact, sea water pearl powder contains almost the same concentration of minerals and trace elements as the human blood plasma. Minerals include calcium, magnesium, calcium carbonate, calcium phosphate, magnesium carbonate, zinc, iron, strontium, copper, selenium, strontium, silicon, ferric oxide, silica. The essential amino acids are: arginine, histidine, isoleucine, leucine, lysine, methionine, phenylalanine, threonine, tryptophan, valine, and non-essential amino acids; aspartic acid, glycine, alanine, glutamic acid, tyrosine, and serine. Read More About Why Amino Acids Are Essential For Radiant Health & Longevity. These essential building blocks of collagen and protein each have a specific function. Lacking any one of the key amino acids cause the skin to become dry, faded and wrinkled. Researchers claim that various components of pearl can stimulate the metabolism's activities of the genetic material in a cell - the DNA and RNA - thus promotes and accelerates the regeneration of new cells. Our Seawater Pearl Powder is 4000 mess (fineness) for peak performance. Nanoscale Pearl Powder, 6,000 mess or higher can be purchased at a higher cost, however because of it's fineness, organic molecules such as protiens are lost in the milling process. The value of the formulation approach needed for Nanoscale makes for poorly water-soluble pulmonary medicines. The method of development of nano pearl powder, although the primary particles is small, dispersion is poor, as is the medicines, and the health product is not high. Our Pearl Powder is ultrafine powder and is not subject to the mixing process of dispersant, suspension stabilizers, and fungicides, as Nano Pearl Powder's higher mess count is. Our Pearl Powder is Pure, no toxins are used in the processing. Are Oysters Harmed Or Die When The Pearl Is Removed? Harvesting pearls does NOT harm or kill the oyster, on the contrary, Pearl Farming improves the quality of life within the oyster. Pearl farmers take great care not to harm their oysters in the harvesting process. The harvester very carefully opens the oyster and removes the pearl using a surgical instrument. Removing a pearl does not harm the oyster, in fact, they can then insert a new nucleus and grow another pearl inside of the same oyster. French scientists have proven that pearl can reduce bone loss. Chinese scientists have discovered that calcium from pearl is more easily absorbed by the body than the regularly used calcium. They found it delivers significant high bone mineral density (HBMD), high bone calcium content and high total bone weight. Scientists have discovered that pearl is one of the most effective ways to prevent osteoporosis. The DNA involved in the creation of peal is nearly identical to the part of the human DNA that is responsible for the regulation of calcium metabolism in the human body. As you've probably heard from any muscle-bound behemoth, protein is the key to building muscle. Your body is constantly draining its protein reserves for other uses, like making hormones. The result is less protein available for maintaining or building muscle. The fact is, muscle is absolutely vital to our overall health. Pearl Powder builds and replenishes lean muscle mass because of it's high protein content. Protein is composed of building blocks called amino acids which performs a variety of functions in the body such as building and maintaining healthy muscles when combined with diet and exercise. Getting enough protein is critical for optimal muscle gain. Aside from allowing us to move freely to perform everyday tasks, muscles play a pivotal role in boosting our metabolism and immune systems, as well as increasing bone strength and aiding weight loss. A study published in the Public Library of Science ‘One’ journal found that low muscle mass may be an early predictor of diabetes, independent of body fat. In other words, it’s possible that regardless of your body fat percentage, the less muscle you have the more likely you are to develop diseases such as diabetes. Muscle mass is also essential for bone protection. The larger the muscles around our joints and bones, the less likely we are to injure them. This layer not only protects against breaks and dislocations but as our tendons and cartilage grow stronger with our muscles, we also become less susceptible to sprains and tears. There is an array of health benefits that muscle mass offers. Gaining muscle mass doesn’t mean you must become a bodybuilder, but by adding protein to your diet, you are opening up not just great physical benefits and protections, but emotional well-being as well. Pearl Powder is a complete protein, supplying all nine essential amino acids. If you’re looking to up your protein intake, try pearl powder today. Protein is an extremely important macro nutrient and that should be taken daily. 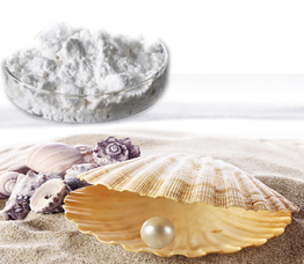 Pearl Powder is used in Spa Treatments and as an exfoliator. It removes the top outer layer of dead epidermis cells, exposes the supple layer of smooth skin, and promotes new cell regeneration. It leaves your skin more receptive in receiving skincare products. Applied to the face and body, it makes your skin silky and pearlescent; applied on hands and feet, it smooths and softens dry, flaky, calloused skin. We have an array of Luxury Pearl Powder Spa Treatments that you can do in the comfort of your own home. It seems everyone jumped on the bandwagon seeking to sell this magical powder, but many have gotten ill, and or have had adverse reactions on their skin. There is a lot of fake powder out there, so it is wise to be careful what you buy and who you buy it from. If they don't have a GMP Certificate, you'll want to run as fast as you can. Good manufacturing practice (GMP, also referred to as 'cGMP') a system that ensures that medicinal products are consistently produced and controlled according to quality standards appropriate to their intended use and as required for specification. GMP covers all aspects of production; from the starting materials, premises and equipment to the training and personal hygiene of staff. You will also want to be careful of the mess, or fineness. Anything above 6000 mess is mixed with dispersant, suspension stabilizer, and fungicide, then sheared at a high-speed, using a high speed shearing machine, that's why it is so expensive. Less than 6000 mess must be sterilized of course, but it is not mixed with any dispersant or fungicides. Be sure whoever you purchase pearl powder from has a COA (Certificate of Authenticity), which will specify the content and toxicity. 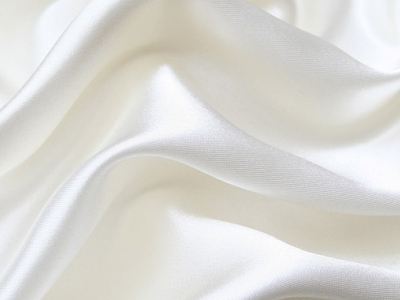 We have a GMP Certificate, a COA Certificate and all the details on Quality Control. When you buy Pearl Powder, be sure you buy Pure, Natural, High quality Pearl Powder. Our Pearl Powder comes directly from the great South Sea of China. It is not Mother of Pearl! Though both Mother of pearl and Natural Pearls are made from nacre, the Mother of pearl is formed in the shell linings, and Natural Pearl is formed when a foreign body is enclosed within a shell. Natural pearls are made of calcium carbonate, where mother of pearl is not. Mother of pearl is significantly less expensive than their natural counterparts. The ocean contains an array of bioactive molecules that are actively being researched for their health benefits, one such aquatic material is a pearl. There are numerous minerals, nutrients and stable pH measurements in Saltwater that Freshwater has not. Sea pearls contain a wide variety of natural minerals because the ocean is full of minerals and nutrients. Seawater contains more dissolved ions than freshwater. However, the ratios of solutes differ dramatically. For instance, although seawater contains about 2.8 times more bicarbonate than lake, river, or pond water based on molarity, the percentage of bicarbonate in seawater as a ratio of all dissolved ions is far lower than in river water. Bicarbonate ions also constitute 48% of river water solutes but only 0.14% of all seawater ions. Differences like these are due to the varying residence times of seawater solutes; sodium and chlorine have very long residence times, while calcium (vital for carbonate formation) tends to precipitate much more quickly. The most abundant dissolved ions in seawater are sodium, chloride, magnesium, sulfate and calcium.